1921: "The Moon and the Great Wall"
Title text: And arguably sunspots, on rare occasions. But even if they count, it takes ideal conditions and you might hurt your eyes. Re: 1921: "The Moon and the Great Wall"
The Great Crater of the Moon was made to keep out invading Martians. Super true. So the only man-made stuff you can see from the moon is the man-made stuff that's actually on the moon itself? Makes sense. Pfooey. 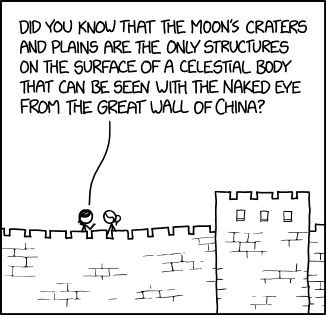 Everyone knows that The Great Wall is actually a coded message to a marooned space alien. Lake Nasser is visible from the moon (in an earthrise photo taken by the LRO). I would presume multiple other man made lakes are, as well. Cities, as a unit, are visible on the night side. Did you know that if you're standing on the Great Wall of China, you can see the Great Wall of China? Which is a man-made structure located on the third celestial body orbiting the star known as Sol. xtifr wrote: Great Wall of China...is a man-made structure located on the third celestial body orbiting the star known as Sol. I came here to make a similar observation, but since you got to it first, I'm going to go with the contrarian route. dictionary.com wrote: pertaining to the sky or visible heaven, or to the universe beyond the earth’s atmosphere, as in celestial body. Wiktionary wrote: A natural object which is located outside of Earth's atmosphere, such as the Moon, the Sun, an asteroid, planet, or star. But then Merriam-Webster chose to be contrarian to that argument. It seems to me like you are missing the obvious, if obsolete, meaning of "Celestial", as pertaining to Imperial China. DanD wrote: Lake Nasser is visible from the moon (in an earthrise photo taken by the LRO). I would presume multiple other man made lakes are, as well. Cities, as a unit, are visible on the night side. Ah, you're right, you would have gotten me there, but luckily, I did not write "all man-made stuff you can [...] see from the moon". On the other hand, to make the great wall myth sound more exiting/exceptional, it is usually stated in a manner that excludes those examples, like "individual man-made structure" or something. DavidSh wrote: It seems to me like you are missing the obvious, if obsolete, meaning of "Celestial", as pertaining to Imperial China. There's potential for an advanced pun somewhere in there, but I can't quite find it.